KJZZ TV’s new series Discovery Road journeys along Highway 89 in Central Utah, exploring the area's charming small towns and unique history in a '55 Pontiac. --- The show premiered last Sunday, but will continue for a few more weeks on Sundays at 7:30 pm. Seeing some of the stops on the show brought back fond memories of when we visited the area last summer for a City Weekly article we did about celebrating the 4th of July in Utah’s small towns. Here are some of the highlights if you get down that way. Check out: The last of a dying breed, the Basin Drive-In Theater is a classic small-town drive-in in Mt. Pleasant. However, it is also famous for its cheeseburgers, and locals are just as likely to stop by for a bite to eat as they are to stay for a movie. In Spring City, take a walk downtown and visit one of the many art galleries open on the town's main street, or just take in the historic architecture. Try this: Hit up the Home Plate Cafe (215 North State Street, Fairview, 435-427-9300) for its famous biscuits and gravy. 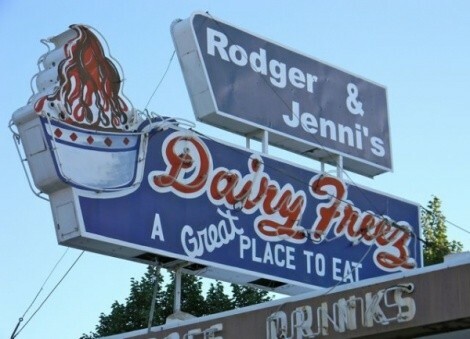 For dessert, stop by Rodger and Jenni's Dairy Freeze in Mount Pleasant to try the Bishop Shake, the specialty, or the Sugar Plum Cottage in Spring City for a shaved ice with sweetened condensed cream or a soft-serve in a truly astonishing variety of flavors. Sleep here: A city landmark, the Historic Manti House Inn is a cozy bed and breakfast just a block from the Manti Temple. Take a carriage ride around town or relax in the inn's dining room. In Spring City, the Osborne Inn offers its guests complimentary bike rentals for cruising around town or striking out on one of the many nearby bike trails. The Travel Tramps regularly write about their treks near and far in City Weekly and host the weekly Travel Brigade Radio Show.